Travel and History at Online Highways and US History: Depression Coming? How about some Campbell's Soup. Depression Coming? 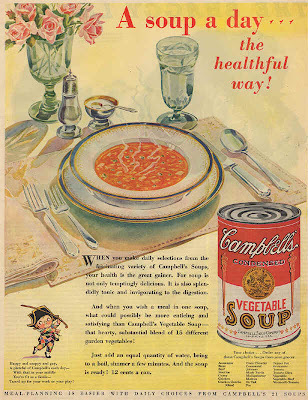 How about some Campbell's Soup. DOW 200 vs current DOW 8400 = 42x increase. So be thankful that Campbell's soup remains ... a bargain even in these troubled times. Most of the cost was in the can itself. Well researched site! Thanks for the work. In my opinion, writing is the best way to deal with it. You can read info from this source to find out more info about topics.